Vancouver Christmas Market's new home is nearly 70% bigger | Jordan Kutev Architect Inc.
No need to head to Düsseldorf or Dresden this December to see a giant Christmas pyramid in the public square. 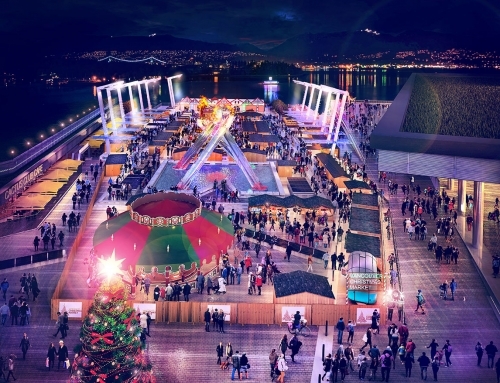 The Vancouver Christmas Market will feature one standing seven metres tall at its new home: Jack Poole Plaza by the Olympic cauldron at the Convention Centre. Known in Germany as a Weihnachtspyramide, the pyramid will be a giant replica of the more common tabletop versions that spin from candle heat while angels circle above. It is a collaboration that included Jordan Kutev Architect Inc., Krahn Engineering and Lukas One Productions. Kluetz had missed the Christmas markets back in his hometown of Hamelin — of Pied Piper fame — since he left Germany in 1990. The first Vancouver Christmas Market, in 2010, drew 120,000 visitors. Kluetz expects 200,000 this year (the market runs from Nov. 26 to Dec. 30). With 21 new vendors bringing the total to more than 70, the market has outgrown the plaza at the Queen Elizabeth Theatre. Jack Poole Plaza has 50,000 square feet of space, about 20,000 square feet more than the Q.E. plaza. “The good old traditional vendors are coming back and there are some exciting new ones,” Kluetz said. About two-thirds of the vendors sell crafts and other merchandise from their wooden huts, one-third sell food and beverages. Tickets start at $4 and more information can be found on the market’s website. The hours are 11 a.m. to 9 p.m. except Christmas Eve (closing time is 6 p.m.) and Christmas Day (closed). Besides the pyramid, there will be a new Alpine Haus (a huge heated tent with North Shore views), German and Austrian beers to sample (the Austrian, Stiegl, has been a family-owned brewery since 1492), as well as glühwein (mulled wine) and feuerzangenbowle (rum-based punch), spaetzle, goulash and handbrot, and children’s entertainment. And of course Weihnachtsmann, or as he’s better known here, Santa Claus.